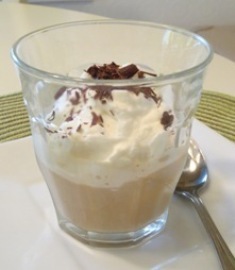 Affogato is an Italian drink that makes a wonderful alternative to iced coffee on a hot summer day. Affogato literally means "drowned". It generally consists of gelato (Italian ice cream) that is topped with hot espresso or a liqueur. Mix sugar and cornstarch in a small saucepan. Whisk in the egg yolks, lemon zest and juice until blended. Cook over medium heat, stirring constantly until mixture boils, about 3 to 4 minutes. Reduce the heat to medium-low and cook 2 minutes longer. Remove from heat. Pour the mixture through a strainer set over a bowl. Place a piece of plastic wrap directly on the surface. Refrigerate at least 1 hour and up to overnight. 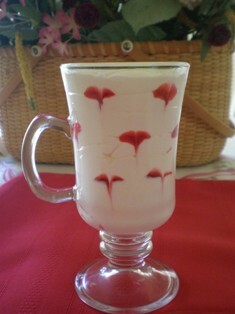 Using an electric mixer, beat the cream until stiff peaks form. Fold in the lemon mixture until well blended. Refrigerate about 1 hour before assembling the parfaits. With a spatula, press the jam through a strainer set over a bowl to remove the seeds. Add a few drops of food coloring to the jam until bright red. Have ready 4 clear glass parfait or champagne glasses or goblets. Transfer mousse and jam into separate pastry bags. Cut a 1/2-inch tip off the bottom of the mousse bag and a tiny tip off the jam bag. Pipe a small amount of mousse into the bottom of each glass. Pipe 3 or 4 dots of jam on the mousse against the inside of the glass. Cover with another layer of mousse. Insert a skewer through the top layer of mousse into the center of one jam dot. Push the skewer down through the jam against the side of the glass. Pull the skewer in and up and see that a heart has been formed. Continue forming hearts with the remainder of the jam dots. Repeat layers of mousse and jam; top with a layer of mousse. Refrigerate until serving. The Italian word, spuma, means foam or froth. In this recipe egg whites create a type of frozen meringue. Bring water and 1/2 cup sugar to a boil in a small saucepan. Stir until the sugar dissolves; remove from heat and cool slightly. Refrigerate the syrup for 30 minutes. Slice 3 of the peaches. Add them to a food processor with half of the raspberries and 1/4 cup of the cooled syrup. Puree the mixture until smooth. Taste and add more syrup if you prefer it sweeter. Press the mixture through a fine sieve; discard the solids. Refrigerate for 1 hour. Put the egg whites and remaining 1/4 cup of sugar in a heatproof bowl. Place the bowl over a saucepan of simmering water. Whisk until the sugar is dissolved and the mixture is hot, about 2 minutes. Remove from the heat. With an electric mixer on high speed, beat the mixture until stiff glossy peaks form. Gently fold the fruit puree into the egg whites. Freeze the mixture in an ice cream maker according to manufacturers instructions. Transfer the spuma to a container and freeze for at least 1 hour. Slice the 2 remaining peaches. Layer the peaches and remaining raspberries with the spuma in 4 glasses. Note: The egg whites in this recipe are not fully cooked and should not be eaten by persons with health concerns. Combine chocolate chips and half-and-half in a small saucepan. Cook over very low heat 2 minutes or until chocolate melts, stirring constantly. Set aside. Stir together mascarpone, vanilla, and sugar in a small bowl. Set aside. Spoon 1/4 cup strawberries in each of 4 tall parfait glasses. Top with 2 tablespoons mascarpone mixture, 1/4 cup strawberries, 1 tablespoon chocolate. Repeat layers one more time. Refrigerate for 1 hour. Top each parfait with 1 whole strawberry. Break 4 of the ladyfingers into 3 or 4 pieces. Place them in the bottom of each of the 4 serving glasses. Drizzle a little of the coffee liqueur on them until they are moist. Sprinkle a little of the chocolate shavings over each; dust with cocoa. Add a scoop of the mascarpone gelato and level the surface with a spoon. Repeat the layers again ending with the gelato. Dust the top of each parfait with cocoa powder and few chocolate shavings and serve.